Morning has arrived, our list of activities is long; we dress, eat a delicious breakfast and head out the door. We drive directly over to The Ohio Statehouse located downtown on High Street, this Greek Revival building was completed in 1861 and has served as Ohio’s Capitol building ever since. 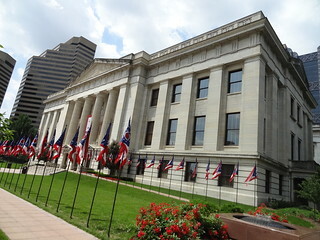 State flags of Ohio wave atop flagpoles that line the walkways, large urns are crowded with tall grasses and annuals in bloom, the white limestone building looms ahead, a fountain trickles nearby, the scene is picturesque. The mercury is rising quickly, the air-conditioned interior provides immediate comfort. Our visit begins at the Statehouse Museum, the area is large; constructed of block and mortar the series of arches create a tunnel-like feeling; the arches themselves function to support the weight of the rotunda. 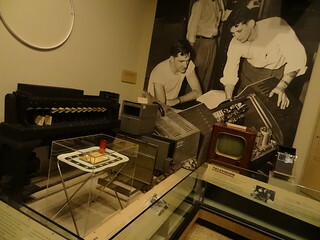 Displays are made up of artifacts and images that tell us the history of the building and those responsible for its design and construction, along with those who have served here. 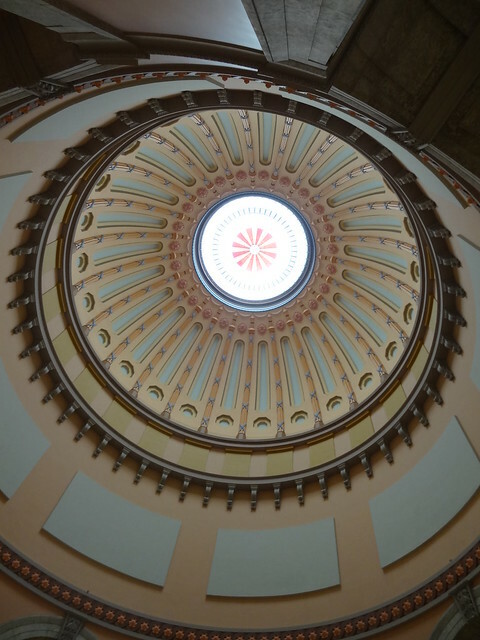 Up the stairs we enter the Rotunda; the dome rises 120 feet above the marble floor, a single skylight bearing the Great Seal of the State of Ohio is lit up by the sun. There’s so much to take in, my eyes are transfixed by the pastel colored dome for the first few minutes. My gaze travels downward, walls are peach-colored, elaborate brass sconces resemble leaves, light glows from glass shades. Giant oil paintings grace the walls, each representing an important piece of the state’s history. Woodwork is minimal, stained dark and quite lovely. 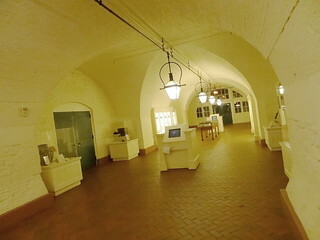 Huge stone archways lead to other sections of the building. The floor itself is a work of art, comprised of 4,957 pieces of marble, the starburst pattern in the center is the real attention-getter; there are 32 points, one for each state in the Union at the time the floor was laid. 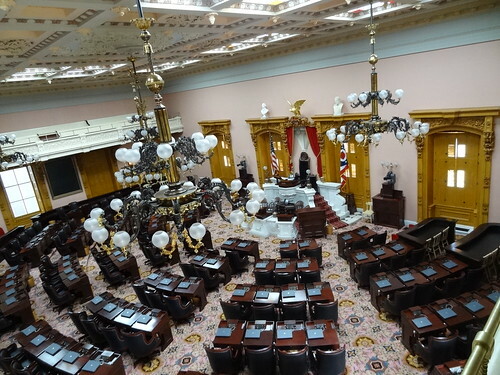 We amble the hallways, stopping in at rooms and galleries that pay tribute to Ohio’s early legislators; spaces are filled with antique portraits and period furnishings. Voices lead us to the House Chamber. We strain to peek in windows, a fellow tourist points out a tiny elevator to the side gallery, we board without hesitation, the elevator comes to a stop and Kris slides the door open….Wow! From the rear balcony we have an outstanding view of the entire room; colors are muted and light. 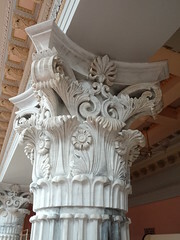 Architecturally, the room differs from the rest of the building; it is elaborate, ornate, decadent in style. 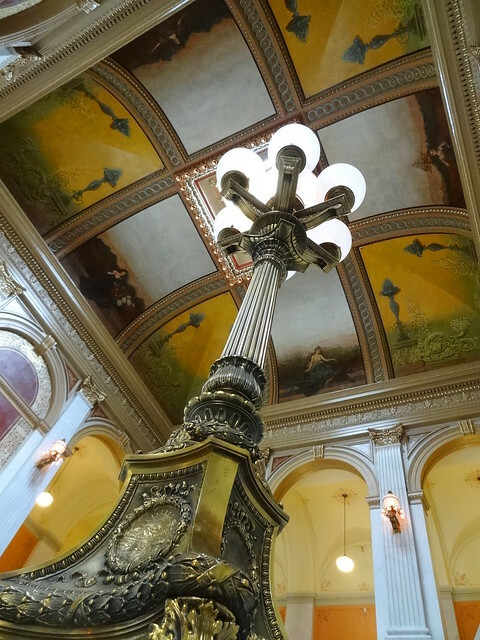 The ceiling is coffered, leaves cast in plaster are three-dimensional, Corinthian columns are rich in detail, lavish chandeliers of brass, wrought iron and frosted glass hang like pendants from the ceiling. Desks date back to 1909 and reside in a semi-circle on rich floral carpet, Abraham Lincoln spoke here in 1861. We move about the room taking it in from all angles. 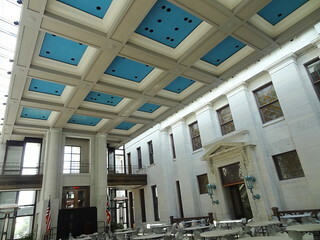 The atrium, built in 1993, connects the original Statehouse to the Senate building, here giant sconces that once weathered the elements show great patina. 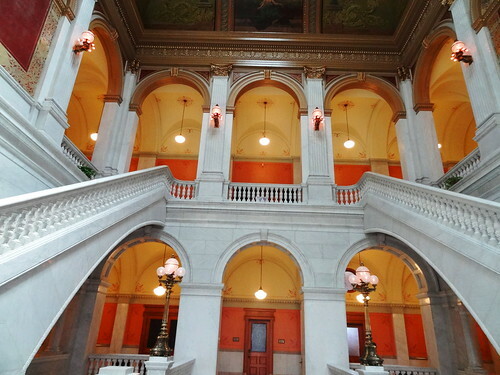 We step inside the building and are face to face with the Grand Stair Hall, the double marble staircases are stunning, the ceiling, spectacular. 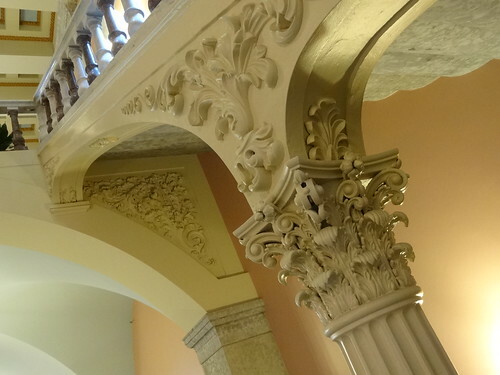 This structure was built in 1901 as the judiciary annex, today all Senate offices are located here. For the next few minutes my feet will not move, the wall ahead a series of stacked arches, my stare finally settles on the muraled ceiling, I tip my head back studying the scenes; art, justice, agriculture and manufacturing are all represented, again a single skylight illuminates the space. Kris is busy snapping photos, I call out to him several times asking if he took a picture of this and that, he assures me he did. We ascend the grand staircase, the area is dimly lit by elegant fixtures, doors are locked but a few windows allow us access. After investigating fully, we leave the building and drive to our next destination. 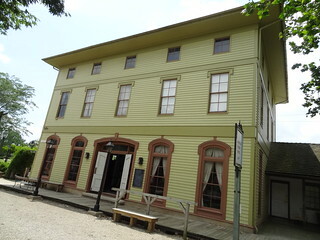 North of downtown the Ohio History Center Museum and Ohio Village give visitors a glimpse into Ohio’s past. 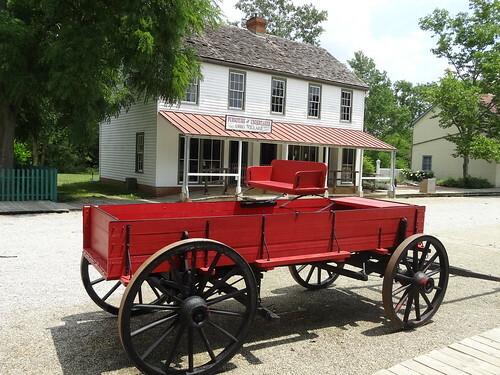 No matter where we travel I like to visit the local history museum, it provides a wonderful connection to the people and community. 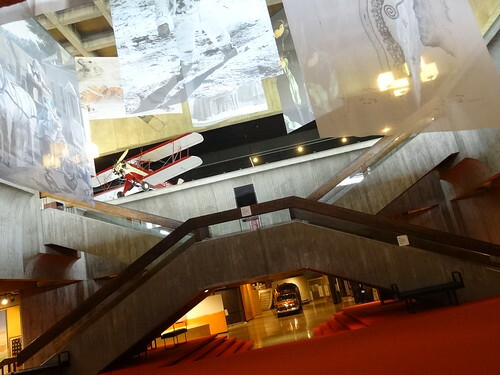 The building itself has a 1970’s feel about it, large open spaces, lots of concrete and windows, kind of funky. 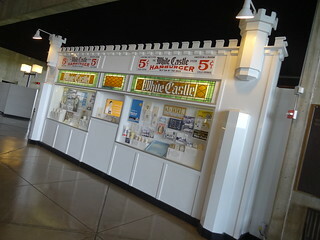 We take the stairs to the plaza level, here we find the permanent White Castle exhibit, yes folks, White Castle began right here in Columbus Ohio in 1921! Glass cabinets display photos of employees in uniform, advertisements, and the famous cardboard cartons those irresistible, little steamed burgers are served in. Just looking at all that memorabilia makes us hungry. 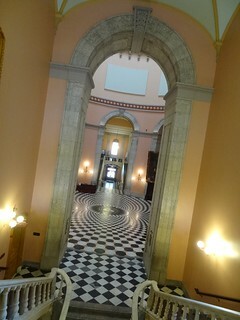 Back on the main level we roam from room to room, beginning in ancient Ohio, traversing centuries to the recent past. Follow The Flag shares stories of the Ohioans who carried battle flags, with actual Civil War battle flags. 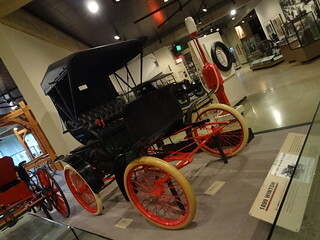 Centuries of Change takes us from agriculture to the auto industry, we sit in an old wooden trolley and look back at early household items such as furniture, toasters, tv’s and vacuums. Just outside the museum doors Ohio Village awaits us; a recreation of a 19th century Ohio village, docents are dressed in period costume and show us what life was like in the 1800’s. 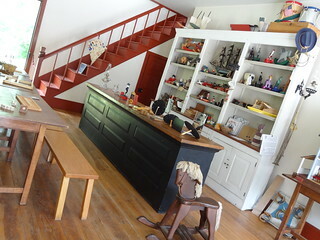 Most buildings are made of wood and are simple in style; the furniture maker is also the undertaker, the owner of the general store welcomes us and tells us about the goings-on in town. The dressmakers shop has a lovely selection of material and hats. Homes and hotels are modest, we smiled at the print shop, letterpress has come full circle and is back in vogue. The gravel pathways take us past the school house, church and bank, leading us back to the museum. Time to catch a quick lunch in town then back to the bed and breakfast to freshen up. Summer is travel time for the Detroit Derby Girls, we make it a point to catch one out-of-state bout each season, tonight we are cheering on our home team as they take on the Ohio Roller Girls. 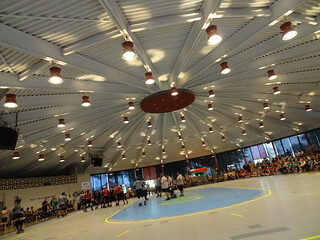 The bout is taking place at the Ohio Expo Center at the fairgrounds, the round building is retro-cool, red lantern-type lights are scattered about the ceiling, walls are made of glass. We are relieved to find 2 open front-row seats, decked out in DDG t-shirts we are definitely in the minority. 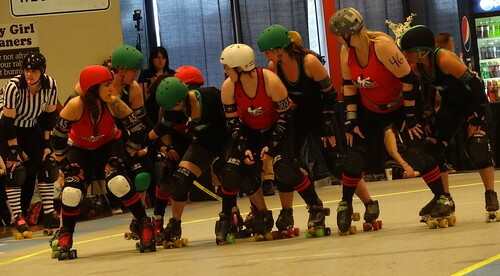 In the first bout Ohio’s Gang Green plays our Motor City Disassembly Line, sadly, our team did not fare well. The second bout started out much better, in the first half it looked as if Detroit’s Fatal Femme, Racer Mc Chaser, Roxanna Hardplace and Ghetto Barbie would be victors over Ohio’s Pearl Rogi, Kill Basa, Burnadeath and Texas Chainsaw Sasskicker. Alas, the second half did not go as well, Ohio pulled away and claimed the victory- ouch! 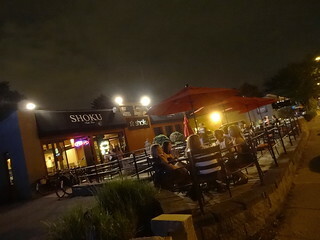 We are having dinner at Shoku in Grandview,another charming Columbus district. Just a few short blocks long, it is home to independent shops, a theater and local sidewalk cafes. It is a perfect summer evening, the temperature has dipped slightly, making it ideal for patio dining. This is one of our go-to restaurants when in Columbus, we don’t need a menu to decide, Fire pot chicken and a couple of sushi rolls. 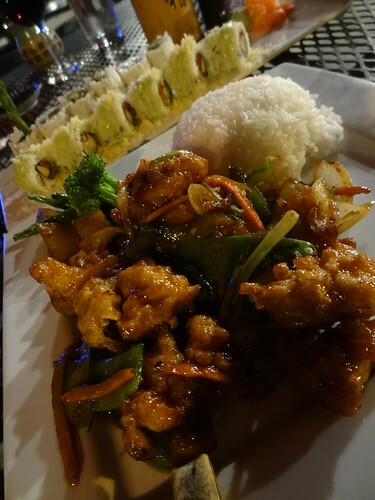 Our selections arrive at the same time, the firepot chicken is lightly breaded, vegetables are crisp, smothered in a light spicy sauce it is delicious, the sushi is fresh and tasty. 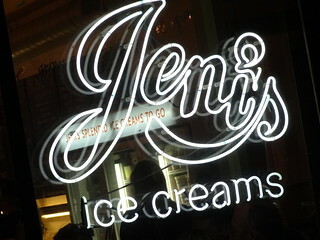 We linger at our table long enough for our food to settle and make room for dessert; Jeni’s Splendid Ice ream is right across the street……. 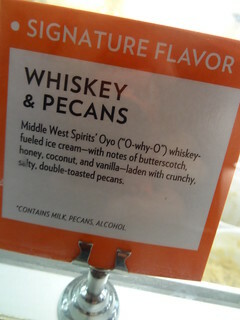 No visit to Columbus is complete without Jeni’s Ice Cream! The sidewalk up and down the street is crowded with folks indulging in tasty flavors such as Whiskey & Pecan, Riesling Poached Pear, Queen City Cayenne or Kris’s favorite, Brambleberry Crisp. The narrow shop is buzzing with activity, servers are busy answering questions and handing out samples, the line moves quickly. A smile appears on Kris’s face as his waffle cone is handed to him over the counter, I wait patiently as my Black & Tan sundae is prepared, Salted Caramel ice cream, dark chocolate hot fudge, hot caramel and a sprinkling of smoked almonds, love it! A sweet ending to a great day.